The disabled man in photo actually is an activist and member of Gonojagoron Mancha and photo is from their protests in Year 2014. “At least six Gonojagoron Mancha activists were injured yesterday afternoon when police charged truncheon on the anti-war criminal campaigners at Shahbagh intersection in the capital. 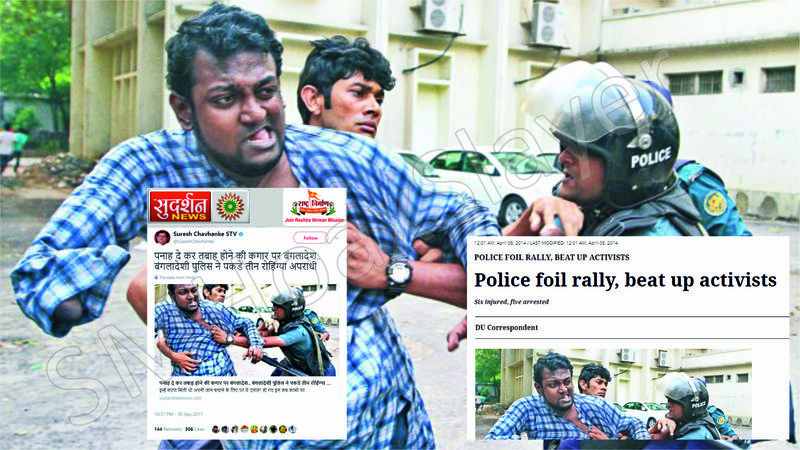 Police also detained five of the activists — Joy, Dhiman, Farid, Titu, and Sohag — from the spot. The Mancha activists had gathered there to hold a rally protesting, what they claimed, attack on the Mancha supporters by some pro-Awami League men Thursday night. ← Can this photo of Currency Notes cut for project result in a heart attack ? Two year old Photos are viral calming Kareena is pregnant again. November 9, 2018 Hoax Slayer Comments Off on Two year old Photos are viral calming Kareena is pregnant again. American schools forcing Muslim Prayers in Schools ? Where minority actually is a majority !